Deadly wildfires have ravaged Northern California this month. People have lost their lives, their homes, their businesses and their sense of security. We asked you what questions you had about wildfires, and this week, Bay Curious has some answers. What does it mean when a fire is contained or controlled? Once a fire starts, the goal is suppression, and the first step is containment. Fire updates often include a "percent contained" figure. It took several days for fire crews to get more than 10 percent containment on the fires burning in Northern California this month. So what does containment mean, and why is it so hard to achieve? 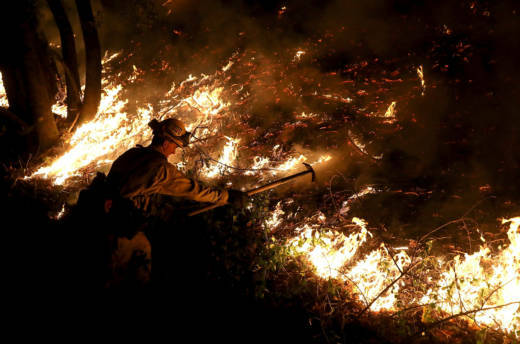 "Containment means that there’s some type of barrier between the area that has been burned, which we call ‘the black’ and an area that has not been burned, which we refer to as 'the green,'" says Cal Fire public information officer Jaime Williams. The "percent contained" indicates how much of the fire's perimeter is surrounded by a barrier. So, for a fire whose perimeter is 10 miles around, if firefighters create a 5-mile-long dirt area around the fire, the fire is 50 percent contained. Several songs in this week's episode are from Petaluma artist Gio Benedetti. He created them as the wildfires were burning, and proceeds from their sale are being donated to the Sonoma County Fire Disaster Relief Fund. Find them on his website. There are two types of barriers: natural and artificial. A stream or lake can act as a natural barrier, and an artificial barrier is often a dirt path dug around the fire. Firefighters will use a bulldozer to create what is called a "dozer line," or manually carve out a path using picks and shovels, which is called a "hand line." "They basically scrape the top layer of the grass off to leave bare mineral soil," Williams says. "That way the fire stops because there’s nothing to burn." Or firefighters will employ a "hose lay," where they'll carry a synthetic hose around the fire, periodically spraying the area inside "the black." 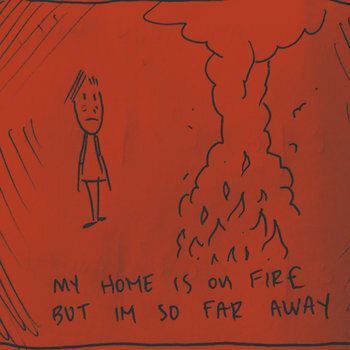 But that doesn't mean fires can't spread beyond a containment line. Winds can carry embers beyond containment lines and cause new fires nearby. And then a fire can go from 50 percent contained to 20 percent contained. Even after a fire is contained, there's still a lot of work to do. How do wildfires get their names? The first fire crew on the scene typically names the fire. Usually, they’re inspired by a nearby landmark like a road, mountain, lake or town. The Tubbs Fire that destroyed parts of Santa Rosa started near Tubbs Lane, just north of Calistoga. The Atlas Fire in Napa was named for Atlas Peak, a nearby mountain. But the naming process isn't always that simple. Since January, there have been more than 6,000 fires in California, which is a lot of fires to name. Two years ago, firefighters in Idaho were facing their 57th fire of the season and couldn't come up with a creative name for the fire. So, they named it Not Creative Fire. Fire names also often include the word “complex,” like the Nuns Complex Fire. That means there are two or more individual fires located in the same general area, and it has been assigned to a unified command. How does California pay for wildfires? Most fires are relatively small -- less than 10 acres -- and funding to fight them comes from Cal Fire’s regular operating budget. But major fires -- like the ones burning in Northern California -- are paid for out of the Emergency Wildland Fire Suppression Fund. Often referred to as the Emergency Fund, it was established decades ago specifically to cover the extraordinary costs associated with fighting catastrophic fires. Since the beginning of July, Cal Fire has spent more than $387 million of its $426.9 million emergency fund for the 2017-2018 fiscal year, intended to last until next June. $125 million of that has been spent since Oct. 9, when the fires started burning throughout Northern California. If the emergency fund runs out, Cal Fire can ask for additional funds from the state’s more than $1.4 billion budget reserve. But that solves only part of the problem. About a third of California is federal land, where fire response and prevention fall mostly to the U.S. Forest Service. It doesn't have an emergency fund. 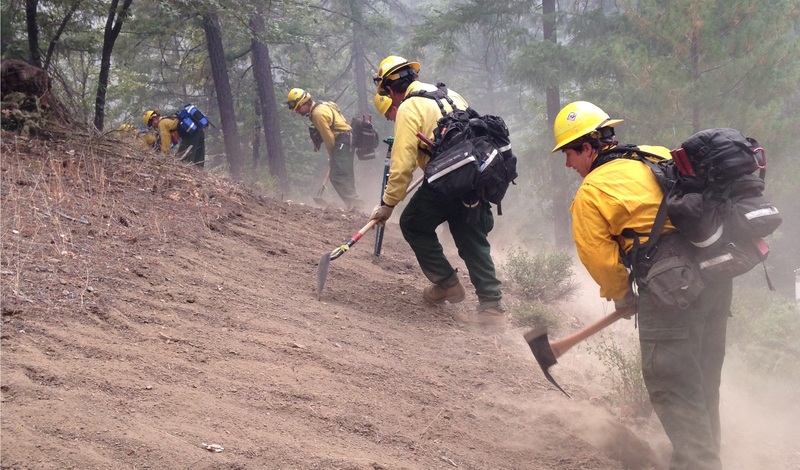 All Forest Service fire funds come from its base operating budget, so when firefighting costs shoot skyward as they have over the last several years, resources have to be cribbed from other budget lines, like fire prevention and forest health, in a system called "fire borrowing." 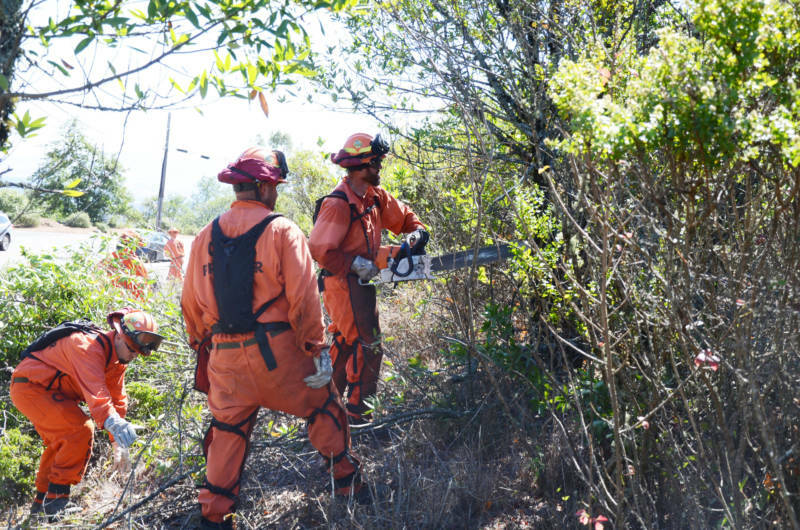 "So real work on the ground to reduce the intensity of fires isn't getting done or is being delayed," says Ken Pimlott, the director of Cal Fire. "It really just further exacerbates the intensity of fires because we can't get on the federal ground in particular to get the fuels treated." The Forest Service has already spent a record-breaking $2 billion-plus on fire suppression this year, and it estimates that it will have to transfer more than a half-billion dollars from other Forest Service programs to cover fire response for the year. Pimlott has been lobbying for years to establish an emergency fund for the Forest Service, and Sens. Dianne Feinstein and Kamala Harris support current legislation that would prevent the need for fire borrowing. Since 2011, Cal Fire's prevention and forest health programs have been funded by a fee on homeowners who live on lands where firefighting falls mainly to the state, and starting this year, they'll be funded by revenues from California’s cap-and-trade program, in which industry pays for the right to produce greenhouse gases (the link being that burning of fossil fuels is deemed a contributor to global warming and hence to more intense wildfires).